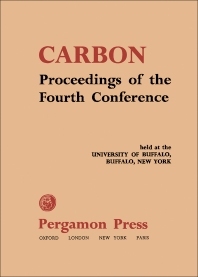 Proceedings of the Fourth Conference on Carbon is a collection of manuscripts presented at the Fourth Conference on Carbon, held at the University of Buffalo on June 15-19, 1959, jointly sponsored by the American Carbon Committee and the University of Buffalo. The contributors explore the manufacture, properties, and use of carbonaceous materials. This book is organized into five parts encompassing 79 chapters. Parts I and II describe the surface and electronic properties, adsorption, and reactivity of carbonaceous materials, including carbon black, activated carbon, coal, and graphite. These parts also cover reactions such as thermal oxidation, gasification, and catalysis. Part III highlights the processes of carbonization, graphitization, and crystallite growth of carbon, while Part IV examines their mechanical and thermal properties. Part V looks into the raw materials used for the manufacture of certain carbon materials and the influence of several properties, including porosity and density. Organic chemists and carbon scientists and researchers will find this book invaluable.